“I'm so happy that I get to share playing Carole with my friends and family back home." - Kaylee Harwood. Photo by Samantha Gaetz. In the first half of our interview with Kaylee Harwood last week, we followed her journey from Vancouver to the Broadway stage. 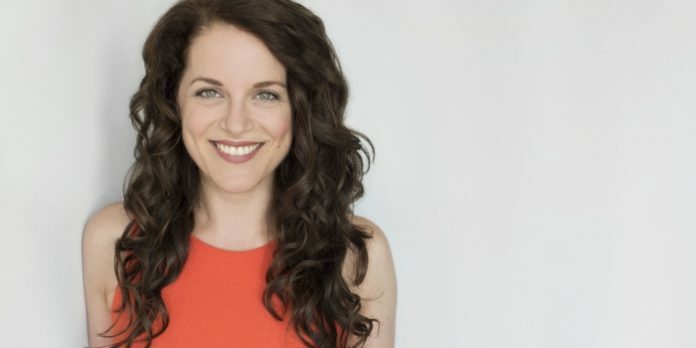 Now fully immersed in New York’s musical theatre scene, including roles in Jesus Christ Superstar on Broadway and as part of the Radio City Christmas Spectacular, Harwood’s rising star would eventually bring her to the touring production of Beautiful: The Carole King Musical, which arrives at Vancouver’s Queen Elizabeth Theatre this month. Like many touring productions of its kind, over time Harwood found herself performing five different characters; three as principals, including as understudy in the role of Carole King herself. Gradually learning the five roles over the course of a year, she has since performed each in equal measures. As the understudy for Beautiful’s central character though, it is understandably the role Harwood finds particularly excited to play. 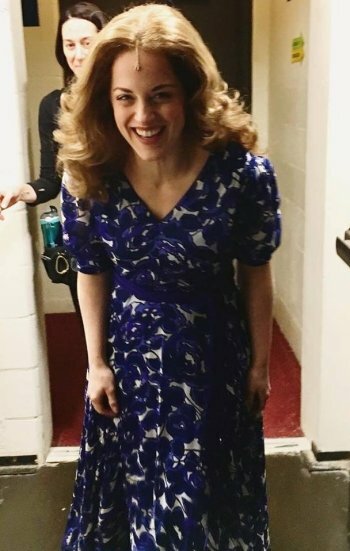 Kaylee Harwood steps out in her debut as Carole King at a performance in Indianapolis, Indiana. Photo by Elena Ricardo / Facebook. And although there are distinctive traits to King’s performance style, Harwood wasn’t out to impersonate the singer. Seeing a similarity between herself and the other women who have been cast in the role, Harwood says the most genuine performances come from a down-to-earth sensibility, and in the musicality. It also helps to have been a fan of King’s music, although it was not immediately apparent to Harwood just how prolific King’s music really was. Harwood first remembers becoming a fan of King via television, long before she would ever play her on stage. Harwood’s fandom has definitely informed her portrayal of the iconic singer-songwriter in Beautiful, in a show that only highlights King’s seemingly endless hits, but one that also chronicles her life. In fact, it is in the performance of “It’s Too Late” in act two from King’s Tapestry album that is a pivotal moment for both Harwood and the audience. It is in that scene where Harwood can see the impact the show is having on the audience. Highlights for Harwood on tour so far have included live appearances on both Dancing with the Stars and America’s Got Talent. “It was exciting to take what is normally a show that’s done for an audience of 2,500 people a night, which is not something to sniff at, and then get to do performances from the show for millions of people in a live broadcast is just an amazing feeling,” she says. But while performing for the masses on live television remains a fond memory, it would be King’s appearance at a performance just a few weeks ago that Harwood and the rest of the cast will not soon forget. 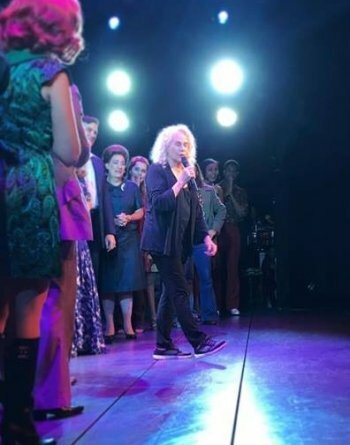 Carole King surprises the cast of Beautiful: The Carole King Musical during the curtain call during a performance in California. Photo: Kaylee Harwood / Facebook. 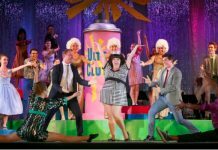 Much more than any single moment on tour or in the show though, Harwood points to the uplifting and family-friendly story which makes Beautiful so enduring and endearing. In having to cover five roles, Harwood usually has no idea which character she might play on any particular night. Fortunately, on her return to Vancouver, she will be given an opportunity to perform as Carole King before a hometown crowd at both the matinee and evening performances at the Queen Elizabeth Theatre on November 18. “I’m so happy that I get to share playing Carole with my friends and family back home,” she says. Beautiful: The Carole King Musical opens at the Queen Elizabeth Theatre in Vancouver on November 13 and continues until November 18. Visit vancouver.broadway.com for tickets and information.